Perogies & Gyoza: International Book Giving Day - February 14th! Next week, February 14th, is International Book Giving Day! The goal of international book giving day is to get books, whether new, used, or borrowed, into as many hands as possible. a) Give a book to a friend or relative. c) Leave a book in a waiting room. How easy is that? There are plenty of used bookstores at which you can buy inexpensive books that will be loved by the recipient. Want more information? Check out the Facebook page, the blog, or Twitter. I am going to tell everyone I know about it. I am going to give books to all the men I have obligations to give to on Valentine's Day (this makes the sexism almost palatable). I am going to give a copy of Sora and the Cloud to my son's kindergarten. I am going to donate to an international book charity (look at this link of many book charities). I am going to buy a Japanese children's book at a used bookstore and leave it in my pediatrician's office. 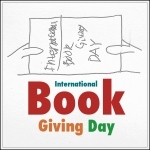 How are you going to participate in International Book Giving Day? What great plans! Do make sure you join our roll call of honour here: http://bookgivingday.blogspot.com/2012/02/were-giving-books-for-international.html and vote (top right in the main blog). So glad to have you involved. These are some excellent ways to honor International Book Day. It's so important to share the love of books. Our neighborhood elementary school participates in a similar event twice a year. Great idea! I think this makes a really nice counterpoint to All Hallows Read - the tradition of giving a scary book for Halloween.